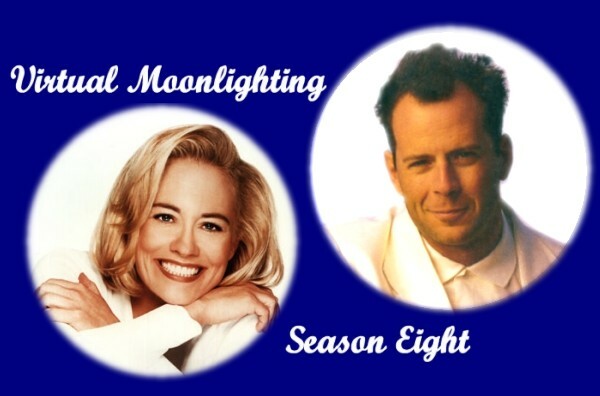 Welcome to Moonlighting Season Eight! Please choose the episode that you would like to read from the list below. Maddie meets with an old friend...and a personal challenge that will test her and David's relationship. Confusion reigns.....in their case, in their lives. Can Maddie and David make it all work out? Is it David's netherworld? Or just a low budget way to solve a case? It's a Trick, Where's the Treat? Written in round robin style. What scary fun. David is back and Maddie's got him. Is there a secret recipe for keeping him? Are David and Maddie on the right road to Thanksgiving happiness? Maddie and David try to find their next client. It is not as simple as you might think. It's Christmas! Love and larceny are in the air. The wedding plans are in full swing for Agnes with Maddie at the helm, but will Richie and Amy make it to their first anniversary? Meanwhile, back on the Left Coast, David and Bert have a weekend to themselves, or do they? The Blue Moon staff sail away to Agnes and Bert's dream wedding. Luckily, they remembered to bring something old. Methinks something is familiar here. David and Maddie juggle a case in which fame is not all it's cracked up to be. Windows? We Ain't Got No Windows! We Don't Need No Windows! I Don’t Need to Show You Any Stinkin’ Windows! Richie just can't get into enough trouble now he is doing it with 16 megs of RAM. But Maddie and David are always around to bail him out. And this maybe the last time. Fun with the Bard and Maddie and David. While the Cats are Away, The Mice ... Work? The Wobblies have taken over the show. An Affair to Forget...A Weekend to Remember. More than you know...or maybe more than they want you to...about Maddie and David's working weekend. Cases and houses and showers ... oh my. Females by the flock....and where's David? A bird of a different feather visits some of our Blue Moon family.